See All Security Systems established in 1995 has been providing customers with reliable Automatic Gate & Security Solutions with Alarm Systems, Security Camera Systems / CCTV, Automatic Driveway Gates, Intercom Systems, Garage Door Openers and Access Control at competitive prices to suit all budgets. 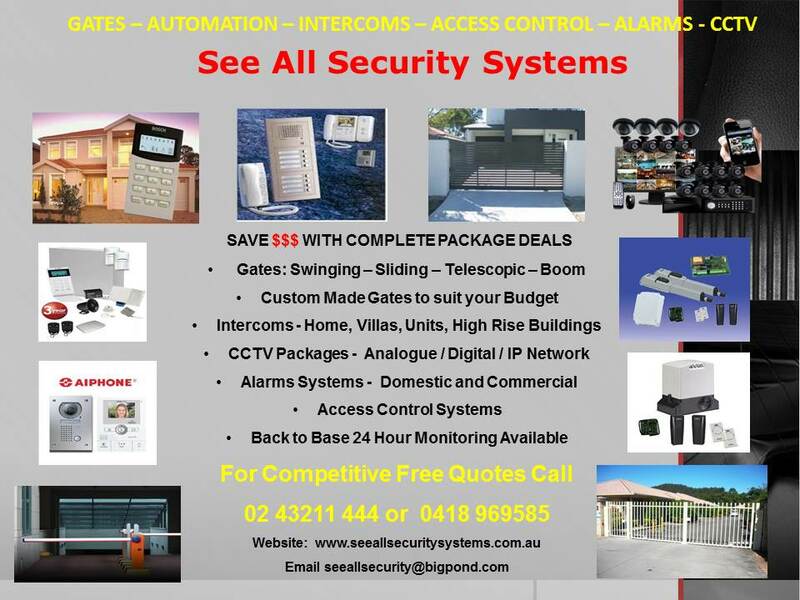 See All Security Systems is a business located in Tuggerah on the NSW, Central Coast, with over 20 years hands on and technical experience we pride ourselves on the quality and reliability of all the products we sell and Install to ensure you as our customer are 100% satisfied that’s our guarantee to you. See All Security Systems prides itself on quality and workmanship and treat each job we undertake as if it’s our own. We are your one stop shop for all your security requirements from the smallest job to the large projects we don’t sub contract work to others, all work is undertaken by See All Security Systems, this ensures you, the customer get a smooth and speedy result. See All Security Systems custom manufacture Automatic Gate Entry Systems, Privacy Screens and Balustrades in our Tuggerah factory and also can co-ordinate your requirements such as security, access control, automated entry systems, lighting and surveillance to talk to each other and can be scheduled to operate in many ways such as events, alarms, sunrise, sunset, day, date, time, motion detection, door opened, just to name a few.